Combine cream and vanilla in a saucepan. Scald and remove from heat. Let cool for 15 minutes. Place egg yolks and sugar in mixing bowl, mix using wire whisk. Slowly incorporate cream into sugared egg yolks. Stir in mango puree and mix well. Do not over mix. Pour mixture into Brule dishes or ramekins. 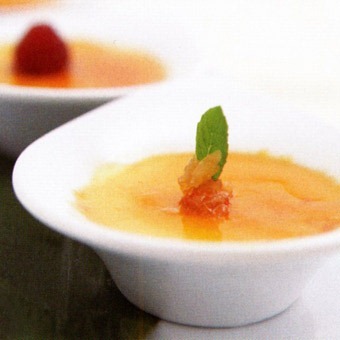 Create a “bain marie” by placing filled brulee dishes in a deep baking pan and adding 1 inch of water to the same pan. Bake in preheated oven at 325 degrees F for 1 hour. Remove and refrigerate overnight. To serve sprinkle 1 tsp. sugar over each crème brulee. Glaze in top broiler or with small torch.